Back in March, Team USA superstar and Olympic gymnast sensation Simone Biles was a guest on “The Ellen DeGeneres Show.” Mid-interview, Ellen oh-so-subtly mentioned Simone’s crush, Zac Efron. Yes, people. That is a leotard covered in Zac Efron’s face. Because why the hell not. As funny as this moment was, Ellen clearly had a method to her madness. And notice he did. It wasn’t long before Zac reached out to Simone. Seems relatively innocent, right? Well, their blossoming Twitter romance didn’t end there. 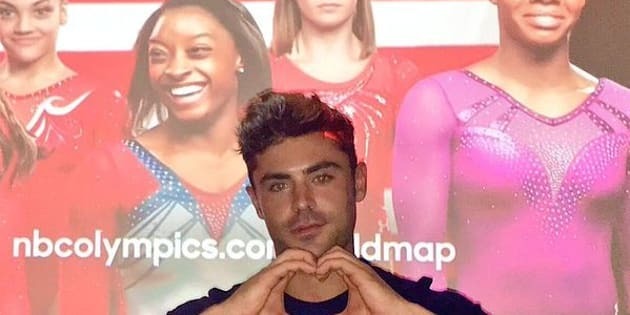 Is that Zac Efron making a heart with his hands? YES IT IS. Where is this flirting going? Could Simone and Zac be the couple America never knew it needed?